Ashamed of your stinky feet and shoes? 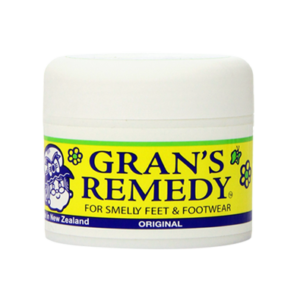 Kick off your shame to the curb with a proven solution that works like magic - Gran's Remedy! 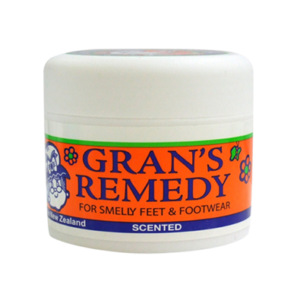 Gran’s Remedy is a powerful all-natural shoe odor eliminator proven to effectively stop bacteria buildup that will leave both your shoes and feet squeaky clean. Yes – the only product you’ll find that treats the foot and shoe simultaneously. 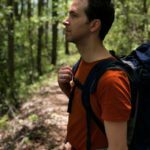 Learn more about us here or shop now! Gran’s Remedy works exactly as stated. A week after I started applying this product, my shoes and feet have gone from annoyingly smelly to next to zero odor, even after a hard day of running. This is a miracle powder! I have found nothing better and I’ve tired many formulas and solutions. Each of them worked to varying degrees while Gran’s Remedy has blown the competition out of the water. Feet go from “Hard to odor-control” to completely, refreshingly odorless and stays that way. I bought this product because my girlfriend complained to me about my foot smell. I was skeptical about it until I used it for the first time, but this one works great! You need to insert the powder before you wear your shoes so you may be bothered but it’s worth trying and using! 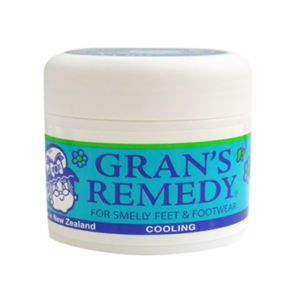 Gran’s Remedy Products ship FREE to contiguous U.S. and to APO/FPO/DPO Boxes. 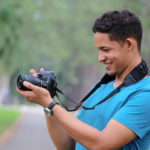 Subscribe to our Blog Newsletter and receive useful tips exclusive promo codes. Gran’s Remedy is granny’s old recipe passed down generations that really works! Hear it from our Happy Customers. Simply join our blog newsletter and get more info & promos!